"To be effective, officers need to inspire fear and respect." The Captain Major is a Jiralhanae rank whose members wear golden power armor. They are the second-highest Jiralhanae Captain rank, though they are deployed more often than the other captain ranks. Captain Majors often lead lower-ranking Jiralhanae, as well as lances of Kig-Yar and Unggoy. A Jiralhanae Captain is promoted to the rank of Captain Major for his ability to rally and inspire other Covenant forces, although the inspiration usually is due to physical threats. Their armor is much more resilient than that of standard Jiralhanae Captains. Jiralhanae Captain Majors can be seen commanding troops on the Type-47B Scarab walkers. The power armor of a Jiralhanae Captain Major is bright gold, making them easily recognizable. A Captain Major's shields are significantly stronger than that of lower-ranking Jiralhanae. They most commonly use the Type-25 Brute shot and spikers. A Captain Major on Installation 00. Jiralhanae Captain Majors are most commonly seen sending Kig-Yar, Unggoy or lower-ranked Jiralhanae into the heat of battle, while they stay back and fire ceaselessly from long range with whatever they are armed with. Their armor can take more damage than others, and with the Mythic or Tilt skulls activated, they can survive a plasma grenade or spike grenade stick (on higher difficulties). On higher difficulties, it takes two sniper rifle or particle beam rifle shots to destroy their power armor and a third shot to the torso or head to kill them. In terms of strength, battlefield adaptability and rarity, Captain Majors are similar to Sangheili Ultras. Apparently they increase the morale of their troops (if one is killed, all nearby Unggoy will flee). They usually use Brute shots, and when under attack will deploy their piece of equipment, usually a bubble shield. In Halo 3 they can be seen commanding troops on the Scarab walkers. Players facing a Jiralhanae Captain Major are advised to grenade the subordinates to death, then either long-range headshot or get up close and melee the Captain Major to death. Using long range weapons gives the player a chance to dodge the ceaseless fire from the Captain Major, and meleeing will cause the Jiralhanae to pause long enough for the player to kill him with additional melee attacks. Jiralhanae Captain Majors often employ the use of a flare, deployable cover, or bubble shield. When the Jiralhanae deploys a bubble shield, the player is advised to seek close range weapons such as an M90 shotgun and assault the bubble shield. Do this by running as close to the Jiralhanae as possible so that they do not use their weapons against you. Instead they will try to melee you. If you are quick enough, you can dodge the Jiralhanae's melee and shoot/melee them in the back, or side. When the Captain Major deploys a flare, the player is advised to either take cover until the Flare is burnt out, or to use the flare to their advantage, using their motion sensor to seek out enemies who are likewise blinded. If he deploys a deployable cover, although rarely, the player should use grenades, or long to short range weaponry to take it out. On the Halo 3 level The Ark you can see a Jiralhanae Captain Major, (but sometimes other Brute Captain ranks) urinating on a wall. When a Pod infector infects a Captain Major with its armor on, it will still become a Jiralhanae Minor combat form because of graphic limitations. When the Thunderstorm Skull is on in Sierra 117 only, you'll see Jiralhanae Captain Majors instead of Jiralhanae Captain Ultras. Even on Easy, the first Jiralhanae the player comes across in Halo 3 is a Jiralhanae Captain Major. 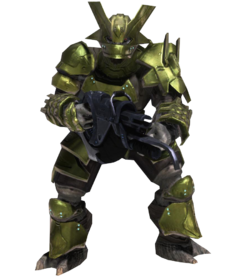 Originally, the Captain Major in Halo 3 was planned to have a deployable shield that would fan out from his gauntlets to protect him from enemy fire. Gold Armour of a Jiralhanae Captain Major. A Jiralhanae Captain Major holding Reynolds. A Jiralhanae Captain Major on the level Sierra 117. A Jiralhanae Captain Major seen in Halo 3: ODST on the campaign level Uplift Reserve. 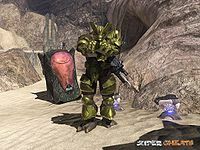 A Captain Major standing with his weapon on his back in Halo 3. A Captain Major engaging with a Sangheili during the Great Schism. A Captain Major during the Battle of Ealen IV. A Sangheili and Captain Major locked together in combat.